The partial shutdown of the U.S. government continues to claim victims - and some of the casualties are military cemeteries abroad. 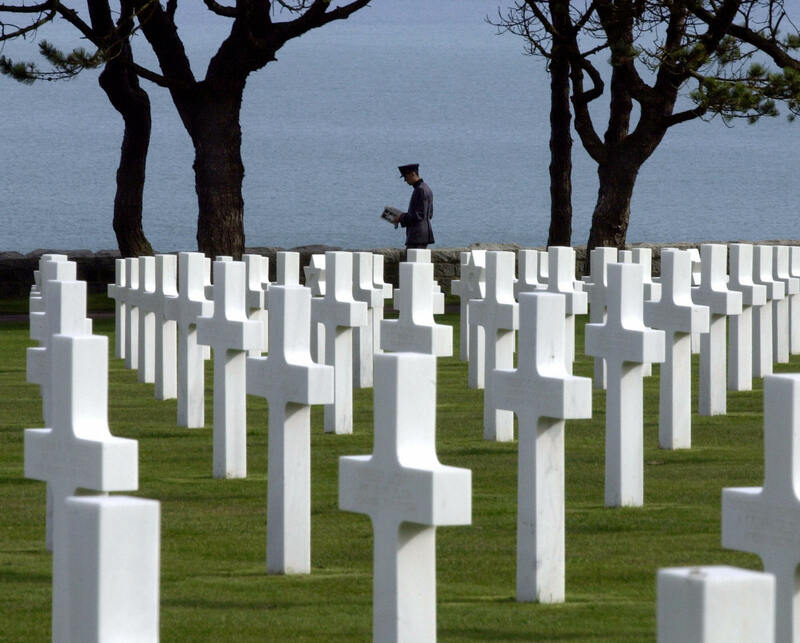 The Normandy American Cemetery and Memorial - the site overlooking the D-Day invasion beaches - is one of 24 U.S. military cemeteries overseas that have been shuttered. The closed cemeteries include 10 in France, and others throughout Europe as well as Mexico, Panama, Tunisia and the Philippines. More than 9,000 military dead are buried at the Omaha Beach cemetery, which is maintained by the American Battle Monuments Commission. Nearly 125,000 U.S. servicemen and women are buried at its cemeteries, and 94,000 missing service members are honored on tablets. The government shutdown has also closed the World War II Memorial in Washington, D.C. Dozens of veterans from Mississippi and Iowa arrived for a scheduled visit to the memorial Tuesday morning - only to find it barricaded by the National Park Service. Benjamin Joyner was among the veterans who were first rebuffed by the memorial's barricades. "I just wonder what we fought for," Joyner told CBS News correspondent Jeff Pegues. "Back then, I had a pretty good idea, but now I just wonder. The way that things are going, they're not working together, they're working against this country, they're trying to destroy it." The veterans were eventually escorted past the barriers by members of Congress so they could see the monument. Another group of World War II veterans from the Chicago area is on a mission to visit the memorial on Wednesday. "We are going to go right the hell in there," veteran Aaron Levin told CBS Chicago. "That's what they needed us for in World War II, to straighten things out. We are going to straighten them out now." Mary Pettinato is co-founder of "Honor Flight Chicago," which arranges the trips to see the memorial. She says the veterans are in their 80s and 90s and have waited up to two years for a spot on the plane to go to Washington to see the memorial that now stands in their honor.